Uploaded 10/18/2018 Film / Memory Type Lexar 32GB. Loved it the first time I saw it and it's great to see it on the front page. Well done again. Fantastic! Congratulations on the award, Hassan. Congrats for a well deserved award. 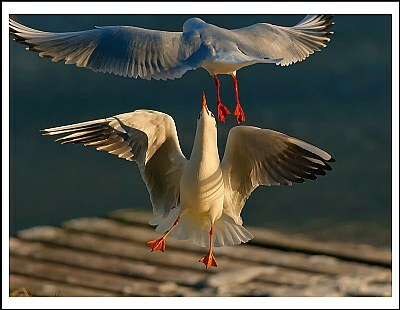 Two gulls caught up in a disagreement and frozen at the optimum moment in time. Well done, great capture.